The Island of Beludia was once inhibited by survivor crusaders, those escaped a big arabien siege in the East. Little is known about the island, even it's accurate location is still unknown. Rumors say that their leader, Beludia was once a childhood-friend of Richard I. When he heared that a big arabian army was heading against his friend, he set off the sea, hoping he'll be able to help Richard. He's never returned, and his two sons believed him to be dead. They were always arguing about who should be the new leader, ending up in a war between the two, that's been still lasting for several years. Then, the island was named Beludia, in memory of their father. 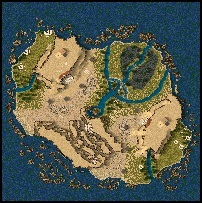 The map is basicly a speedmap, it took about an hour to make it. The structure of the island built itself up, I didn't really make any plans on it. It's a 2 player map, with 4 outposts (2 arab, 2 crusader) for both players. I tried my best on the landscape, it's been years since I used the editor for the last time.